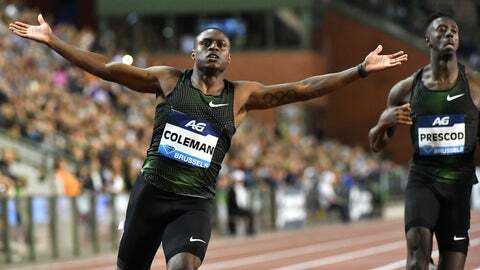 BRUSSELS (AP) — Christian Coleman became the fastest sprinter of the season when he won the 100 meters in 9.79 seconds and beat favored U.S. compatriot Ronnie Baker to win the Diamond League trophy at the Van Damme Memorial on Friday. Coleman set a personal record despite a slight headwind and easily won because Baker totally missed his start and had to recover to finish in 9.93 seconds. Former world champion Yohan Blake finished third. Coleman is 22 and with his win at the end of a strong season, he establishes himself as a new star who could shine at the world championships in Doha, Qatar, next year. In a season without an Olympics or a world championships, the Diamond League stood out. “I got the trophy everyone was shooting for this season,” Coleman said. Colombian Caterine Ibarguen won the long jump at the Diamond League finals, one day after she took the triple jump title in Zurich to assure herself of a $100,000 check for two days of work. She won the long jump with a leap of 6.80 meters, edging Shara Proctor by 10 centimeters. Each win in a Diamond league final is worth $50,000. Croatian discus thrower Sandra Perkovic lost her hold on the Diamond League trophy after six years when she was defeated by Yaime Perez on the Cuban’s final throw of the year-long competition. The reigning Olympic, world, and European champion seemed ready to coast to her seventh title after she took the early lead at the Van Damme with 64.31 meters on her first throw, but Perez hit back on her sixth throw with 65. Also on her final throw, Andressa de Morais of Brazil took second place with 64.65. Perkovic said she had been suffering from the flu for several days, and complained the IAAF should not award the trophy based on one day’s performance.